The Wounded Warrior Project grants students of Fountain Valley High School (FVHS) the opportunity to give back to veterans and their families. 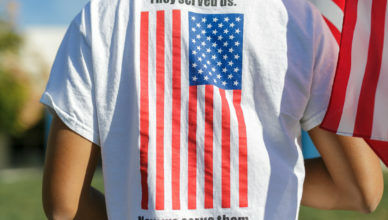 Whether or not the members have a connection to the armed forces or not, the club allows students to become more aware of the situation surrounding veterans in their community. Meetings are held in room B3 on Fridays at lunch. Typically, the club participates in service events with veterans in mind. Their fundraisers typically aim to provide financial support for organizations that help out those who served or those with connections to the armed forces. Along with service hours, members gain unforgettable experiences and invaluable knowledge regarding a large aspect of their local community. Senior Quinn Vuong, Co-President of Wounded Warriors, poses with a Wounded Warriors shirt and an American flag. Photo taken by Vinh Nguyen. The military plays a rather large role in the lives of those with family members enlisted, especially in the United States. Currently, the majority of members have little to no association with the military. The entire club, however, displays extreme gratitude and respect for all servicemen and their families. “Many of our club members do not have any military or vet connections but we are still in this club. We don’t need to have a direct connection to be able to appreciate the soldiers that have served our country,” said Vuong. Poem: This is my city, this is L.A.